Anyway. 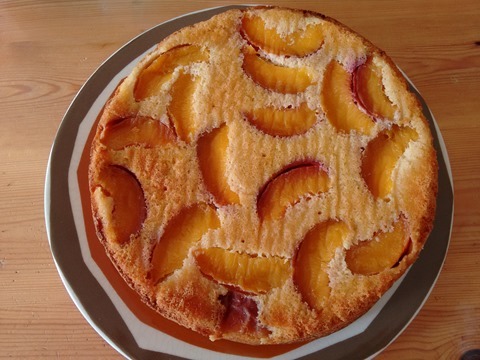 Last week I wanted to make an almond cake with peaches in it. I scoured the internet. Nothing really grabbed me, I was harrassed by my kids, and everything looked over-complicated. So I turned to an old faithful – my ‘Moro’ cookbook, by Sam and Sam Clark. 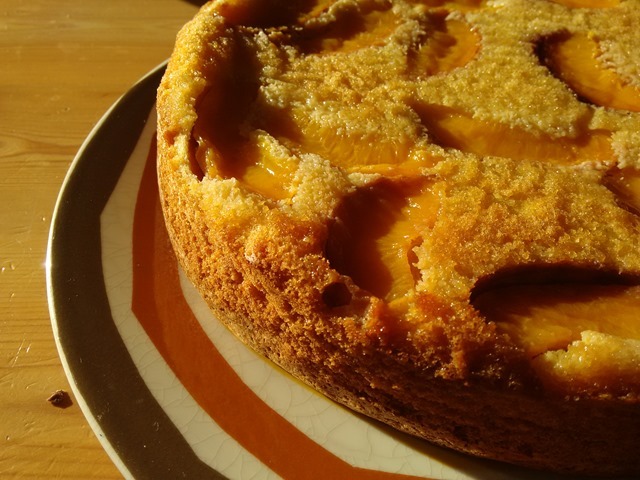 They make an amazing ‘Torta de Naranja’ – an almond sponge flavoured with orange zest and syrup. 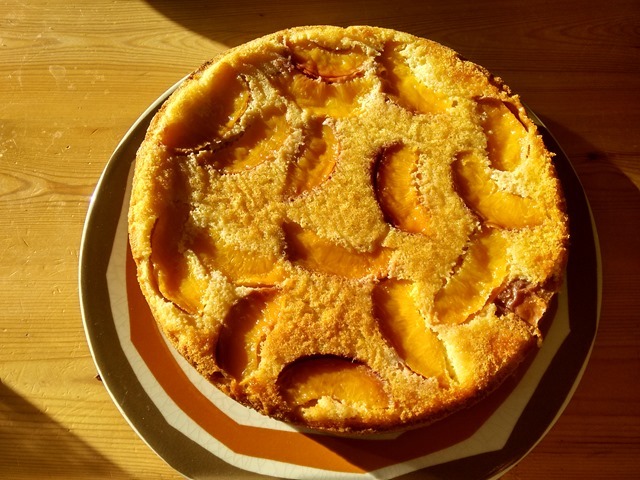 The cake bit without syrup part is so simple – just almonds, eggs, sugar and orange zest. No flour to sift, no having to wait around for butter to reach room temperature. A great cake for the time-starved, such as myself. 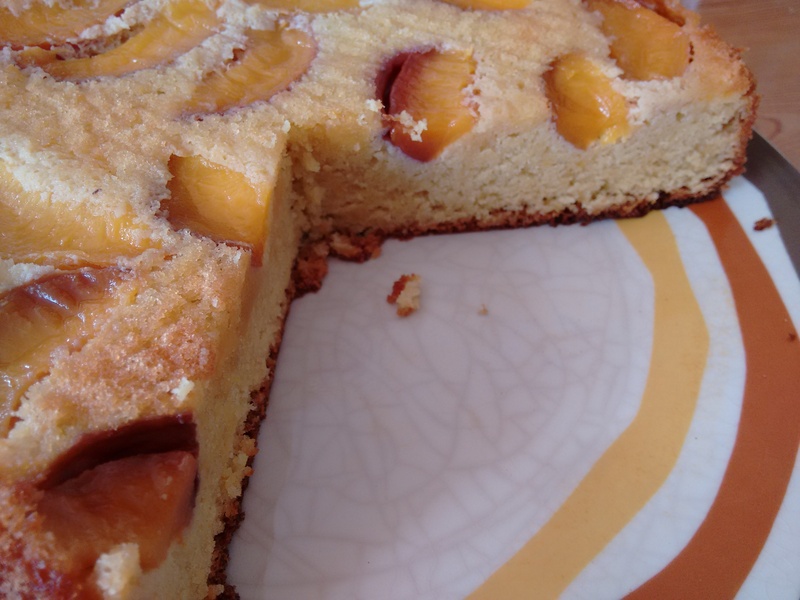 Since I love peaches morning, noon and night, I thought it would be a great idea to use the almond cake mixture as the base for a peach upside-down cake. I had no idea whether it would work, and no time to dwell on it, with two small midgets kids yapping at my heels. The youngest screamed each time I used the electric whisk. To say I was distracted when I made this is an understatement. And still the cake worked! 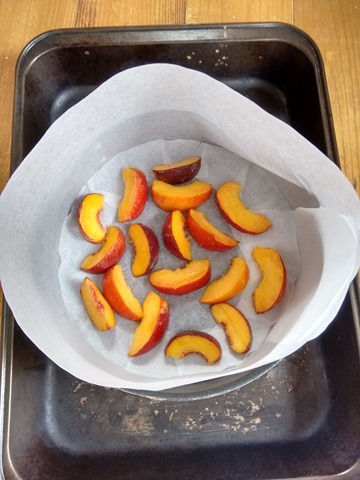 Preheat your oven to 180C and prepare and line a 23cm spring-form cake tin with grease proof paper. Wash and slice the peaches, then put them in a bowl with a tablespoon of sugar. Mix around so that all peaches are coated with a little sugar. Keeping aside a tablespoon of sugar to beat the eggs with, whiz together the sugar and egg yolks until they turn pale. Then add the almonds, vanilla extract and orange zest (if using). Crank up your electric whisk and beat the egg whites with the tablespoon of sugar until they are stiff. 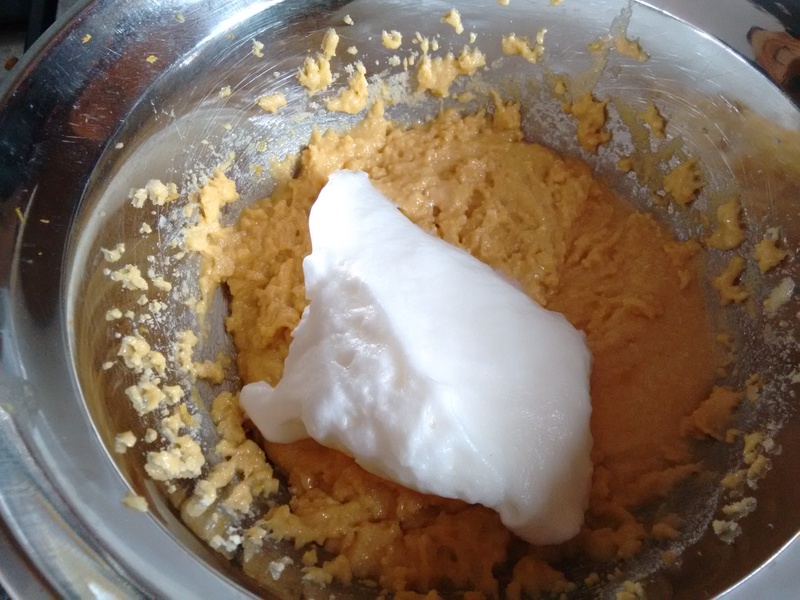 Take the egg white mixture and carefully fold it into the almond mixture. 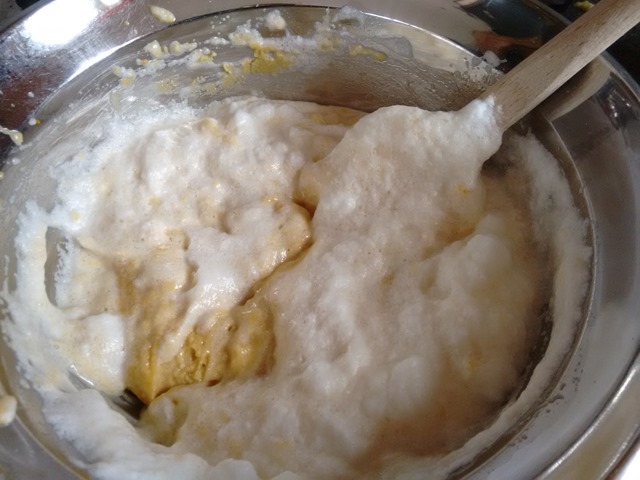 The almond mixture is pretty stiff, so use your whisk to beat in the first few spoonfuls of the egg whites, then after that just use a spatula to fold it all together, taking care not to over-mix and lose the air in the egg whites. 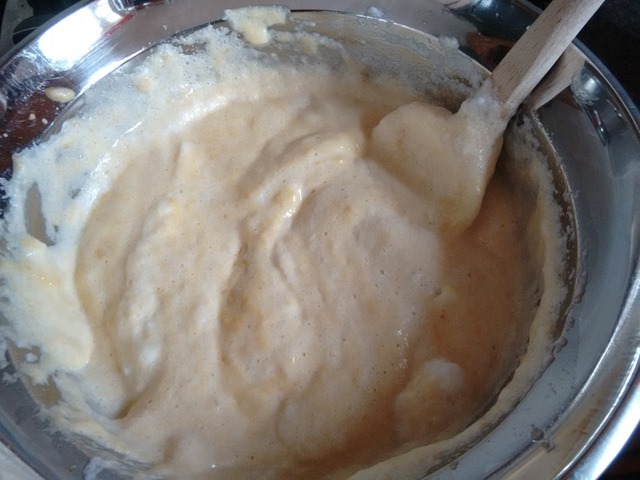 Then pour the batter over the top. Ready to bake! Test the cake with a skewer inserted into the middle after 60 minutes. It should come out clean. Take the cake out of the oven and leave in its tin to cool down completely. 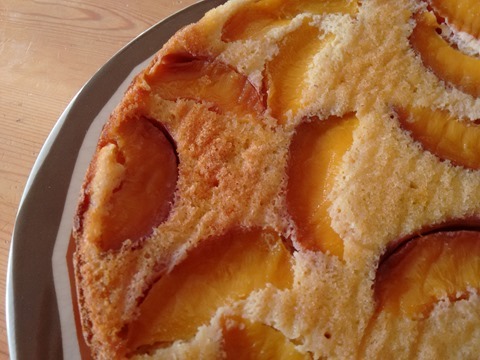 Then to serve, tip it upside down onto a plate to reveal the peachy surface.